Last week, I told you about a document from a group of Argentine Bishops in the Buenos Aires region that made provisions for allowing certain divorced and remarried Catholics who were not living in continence to receive both the sacraments of Confession and Communion. The question was the letter’s authenticity – did it exist, and if so, was it really from the pope? In an update to my original post, I shared a link to a LifeSiteNews story that includes a scanned copy of that letter, which you can view here (PDF Link). Examining the letter, wee see two important elements of verification. Another example of his signature can be taken from this image of his signed note in the guest book of the European Parliament in Strasbourg in 2014. 5) When the concrete circumstances of a couple make it feasible, especially when both are Christians with a journey of faith, it is possible to propose that they make the effort of living in continence. Amoris Laetitia does not ignore the difficulties of this option (cf. note 329) and leaves open the possibility of receiving the sacrament of Reconciliation when one fails in this intention (cf. note 364, according to the teaching of Saint John Paul II to Cardinal W. Baum, of 22/03/1996). It is now, I think it’s fair to say, beyond reasonable doubt that Francis was the author of this letter. 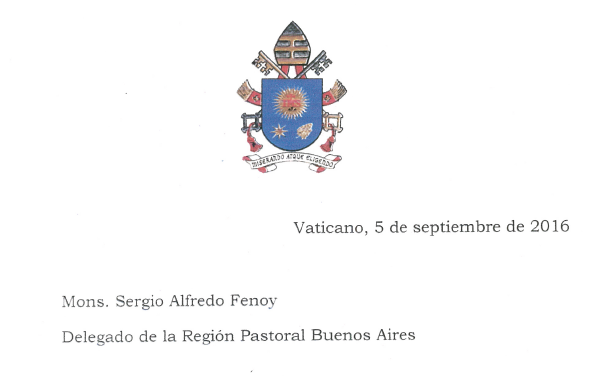 That he approves of the Argentine bishops’ document (even as it has now disappeared from the Infocatolica website pending “revision” after garnering so much publicity — as has their copy of the pope’s letter, both of which they now comment on here.) That he has always intended to create a pathway for the divorced and remarried who are living in adultery to receive the sacraments, and that he approves of those bishops and cardinals who have implemented this interpretation. UPDATE: Just moments after this was posted, I was offered verification that yes, Francis wrote the letter, from no less authoritative sources than the Vatican’s official newspaper and the Vatican News Network. It’s the real deal. Calling All Supporters of 1P5!